Now that we are past 2010 New Year celebrations and are approaching end of January, it is time to take a pause and ask an important question: am I using all the FREE tools to my advantage? If the answer is no, or maybe, then read on. In this short blog, we discuss some of the simple, yet powerful tools, that when used properly can give you a competitive edge. Let’s start with a few that have proven their worth. If you are running an online business and do not have live chat support then you are losing an important channel to connect to potential customer and, thus, are losing sales. LiveZilla live chat support tool offers great value – its FREE! It is a solid tool with good number of options and, best of all, it’s an open source application that can be easily customized and branded to fit your requirements. Research consistently shows that if the visitor has a question when visiting your website then he or she is likely to ask it to your chat support – assuming of course that it is available. Bottom line, chat support increases your probability of generating sales. Some technical expertise is required to install and configure the tool but its well worth the effort. The saying goes something like this – “if you can’t measure it, you can’t manage it.” For an online business, the ability to gather and analyze relevant sales and marketing data, is a must. Google Analytics enables you to understand website traffic sources, keywords used, and a whole range of data about your website visitors. 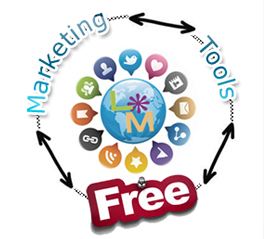 The tool is FREE and provides intermediate level analytical information that can enable you to fine tune your marketing efforts. The cost to you is only few hours of setup time. Skype is probably one of the best voice calling tool available in the online market place. Skype-to-Skype calls are FREE and now include video calls as well. With a large user following, this tool offers a great way for businesses and individuals to connect with each other and to potential customers. Skype also advertises reasonably priced plans which allow the users to place calls to land lines and offers other great features such as voice mails, ability to send SMS messages, and Call Forwarding. Skype is also available on popular Smart phones which is very useful for cost conscious businesses and users. There are quite a few popular desktop sharing and meeting tools such as WebEx.com, GoToMeeting.com, and LogMeIn.com to name a few. Another interesting tool that is very useful for one time use or single session is Twiddla. Say you are working with a vendor to update your website and you quickly need to point out a required change. Simply go to Twiddla, generate a meeting session (with one click), and pull up your website. Send the meeting link to the other party and now both parties can mark up the site together. Once the meeting is done you can save the edited file. This tool is very useful for one-off online meetings. And best of all, its FREE. This is another powerful and FREE tool available from Google. Lets say you do not have Microsoft Word installed on your PC. You receive a Word document from a potential client and need to edit it and send it back. You can go to Google Docs, upload the document, make the edits, save it as a Word document, and send it back to your client. This is very useful for SMEs who do not want to install Microsoft Office, for cost or other reasons, on some or all of their PCs. Google Docs does lot more than just editing of common document formats. Other benefits include ease of sharing and collaboration. For example, you can setup a spreadsheet and other individuals, who are authorized, can update that on a daily or weekly basis. The document can be saved in Excel, OpenOffice, or PDF format. All you need to access and start using Google Docs is a Gmail account. This is a web-based bulletin board that can be shared with friends, family, and colleagues. On this board you can put widgets; a widget could be a note, task, appointment, photo, to-do item, or a document. There are no rules on how you can arrange your bulletin board. Its completely up to you. We found the tool interesting to use. However, this is a not a formal project management tool but a casual sharing platform. So far Stixyboards are FREE or at least we couldn’t find any pricing structure given. Gliffy is an online diagram creating software tool. You can draw up professional quality flow charts, diagrams, floor plans, technical drawings, and more. Moreover, you can collaborate and share diagrams with your team. The tool has a good size object library that should fulfill most, if not all, of your requirements. The basic version of the plan is FREE with certain limitations, but if creating diagrams is important to you then a single seat license for $5/month might be worth the cost. This is an online backup tool for your PC data. The key benefit is the ability to restore you data from anywhere. If you are an entrepreneur or a small business whose employees are on the move then this is definitely worth a look. The IDrive basic plan allows only 2 GB of FREE space but this should be enough to back up your important mission critical data. The tool has a number of features that allow you to pick and choose when and what data you want to back up on regular basis. Features include True Archiving/Sync, Continuous Data Protection, Mapped Drive Backup, Versioning, Timeline Restore, and many more. It also offers personal, family, and business plans. The paid plans are reasonably priced. Disclaimer: Our endorsements are based on our experience in using the above tools. If you decide to use any of the above tools it is your responsibility to review its terms and conditions as Kaya Systems, its management, and affiliates will not be held responsible in any event since we have no control over any of these tools. This entry was posted on Monday, January 25th, 2010 at 12:06 pm	and is filed under Technology Outsourcing. You can follow any responses to this entry through the RSS 2.0 feed. You can leave a response, or trackback from your own site.